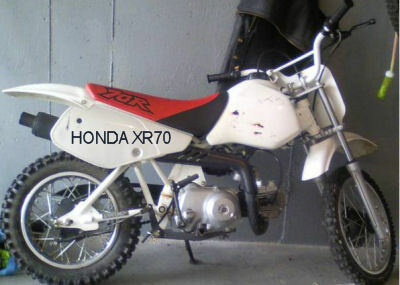 The 2002 HONDA XR70 DIRT BIKE for SALE has all stock plastic, graphics and seat. I have consistently changed the oil and cleaned the air filter often just to keep it breathing clean air. The XR70 was bought new from BC and has a license plate so you won't have to go through the system which will save you a LOT of trouble. All you need to do to make this a hunting motorcycle is to buy a light kit. The bike is stock and quiet. This will make an excellent, reliable starter bike for some young rider and a carb clean should take care of any problems. If you're interested in writing a review of your experiences with a similar dirtbike, you may use the space below provided by GoGoCycles Used Honda Dirt Bikes to do so. GoGoCycles encourages our visitors to share their thoughts and opinions on what repairs might be necessary to fix the used dirt bike to help potential buyers make informed decisions and to benefit the biker community as a whole. The 2002 Honda XR70 for sale is located in Arlington (Seattle WA) and my price for the 2002 HONDA XR70 DIRT BIKE for SALE is $900 and if you're interested or have questions, you can call me (no e-mail) 206-851-Six5 five 5 and don't forget to mention that you found this ad on GoGoCycles Used Motorcycles and Parts for Sale www.gogocycles.com to make arrangements. Would you down on the price any? I might be interested if you could.